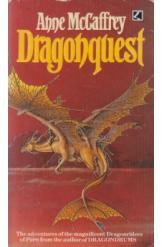 Dragonquest by Anne McCaffrey, Sci Fi. Book is in good condition, all pages intact. With the unrest caused by the Oldtimers beginning to cause the breakdown of Pern's society, the dragonriders fear that they will no longer be able to protect their world from the ravaging Threadfalls. The dragonrider F'lar embarks on a dangerous mission to restore order and get Pern's defenses back up before its too late. Part of the Dragonriders of Pern series.